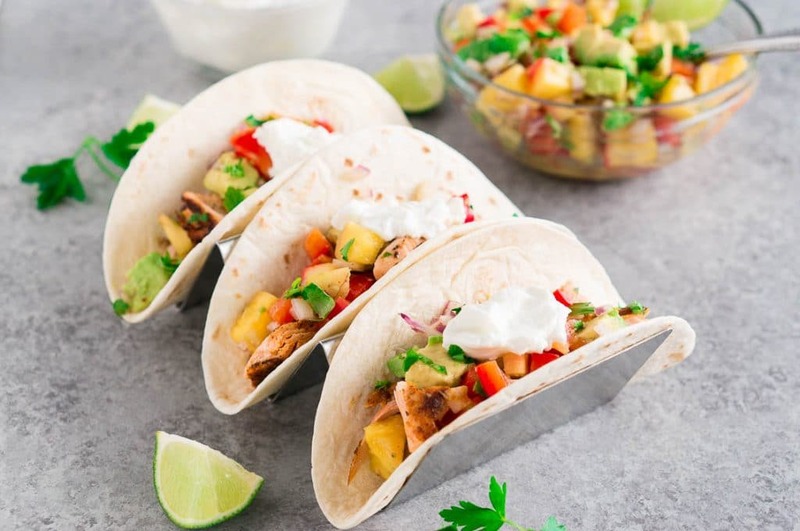 Fresh blackened salmon tacos are topped with a flavorful pineapple avocado salsa and a dollop of Greek yogurt. Easy and delicious dinner that the whole family will love. Disclosure: This post is sponsored by FAGE; however, all thoughts and opinions are my own. A fresh and flavorful way to eat fish tacos – blackened fish tacos with a sweet and slightly tangy topping. The pineapple avocado salsa with lime dressing is the perfect balance between sweet and savory and compliments the fish perfectly. Add a dollop of yogurt on top, and your fish tacos will be amazing! I cook the fish in a cast iron skillet or on the grill. It takes only 3 minutes per side, and while the fish is cooking I make the salsa. It literally comes together in about 30 minutes. It’s such a quick and easy meal – and everyone around the table will be reaching for seconds. With Spring around the corner, this is the perfect time to incorporate healthy foods into your diet and ditch the fast food and sugary snacks. With these healthy fish tacos, you can add some delicious and wholesome food to your menu. Top the tacos with a homemade lime dressing and FAGE Total 0% Plain Greek yogurt instead of a sugary and unhealthy store bought dressing. Did you know that a bowl of Greek yogurt can keep you satisfied with essential nutrients and even help you to maintain a healthy weight? Plain Greek yogurt is a nutrient-packed food that has many health benefits – it’s a protein powerhouse, rich in probiotics which are important for your digestive and immune systems. It also is a natural source of B12, potassium and calcium which are key factors to your overall health. I grew up eating yogurt on a daily basis, and my family and I still incorporate it in our daily menu. Part of this is probably because of my heritage. I was born and raised in Bulgaria – my home country but also home to the live yogurt culture L. BULGARICUS. This is the active culture used as ingredient in every yogurt nowadays. FAGE Total Plain Greek yogurt is all natural Greek yogurt – made with only milk and live active yogurt cultures. It’s also Non-GMO Project Verified. Here are some delicious ways we enjoy yogurt in our meals. I love the rich, creamy and delicious taste of FAGE Total Plain Greek Yogurt. It doesn’t have added sugar (it contains only naturally occurring milk sugar), and it’s protein-rich. Breakfast: One of my favorite breakfasts is blueberry lemon muffins. They are moist and delicious because I add plain Greek yogurt to them – healthy, light and bursting with flavor. You can also make smoothie yogurt bowls for breakfast. 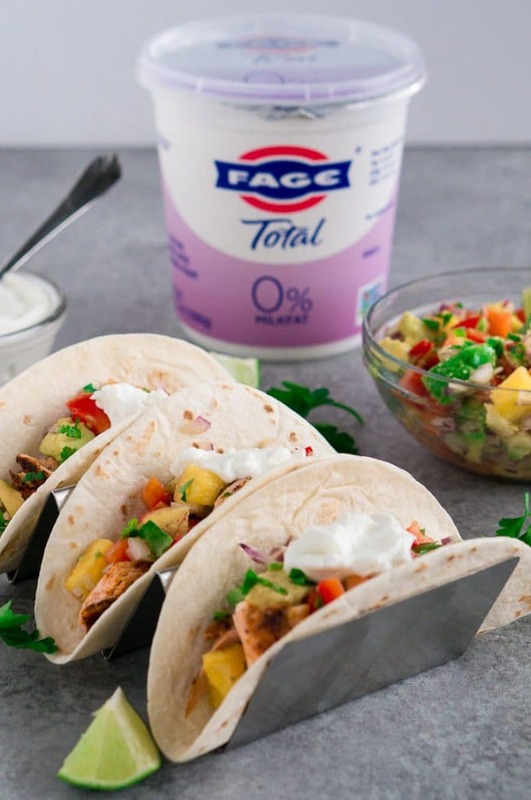 Lunch: In addition to these amazing blackened salmon tacos, you can also enjoy FAGE Total Plain Greek Yogurt as a simple dressing for your lunch salad. You can also make avocado lime cream sauce as a topping for your favorite tacos, nachos or Mexican bowl – the sauce is simply amazing! Dinner: For dinner you can make this Instant Pot Chicken Tikka Masala. The secret to the most tender and flavorful chicken is the yogurt and spices marinade. You can also make Harissa chicken kebabs (also marinated). Truth is, the FAGE Total Plain Greek Yogurt is excellent for marinades. Dessert: You can make these delicious Greek Yogurt Berry Parfaits – I like to add fresh fruit and granola or nuts, and a drizzle of honey. You can also use FAGE Total Plain Greek Yogurt in a lot of desserts and cakes. The yogurt makes them so moist, soft and delicious! Visit the FAGE website for more delicious ideas. I like to serve fish tacos with a light sweet and savory salsa, dressed with a simple lime dressing. For this blackened salmon tacos, I chose pineapple and avocado salsa. It’s made with small pineapple and avocado chunks, finely chopped red onion and red bell pepper. You can also be creative and come up with your own salsa creation (mango avocado salsa, kiwi tomato salsa etc). The sweet flavors in those salsas go wonderfully with fish or ground pork tacos. You can eat the fish tacos as a stand alone meal, or you can add some sides to round out the meal. Some of my favorites are: cilantro lime rice, cabbage & carrot slaw with lime dressing, light cucumber salad, mexican rice, bean salad, tortilla chips and salsa. Mix spices in a small bowl. Coat the salmon filets on each side (on the flesh side only if it has skin on) with the spice mixture. Heat oil in a large cast iron skillet, and cook salmon about 3 minutes on each side, until it’s cooked through and flakes. Shred salmon into large chunks. Mix all ingredients in a small mixing bowl, and season with salt and black pepper to taste. 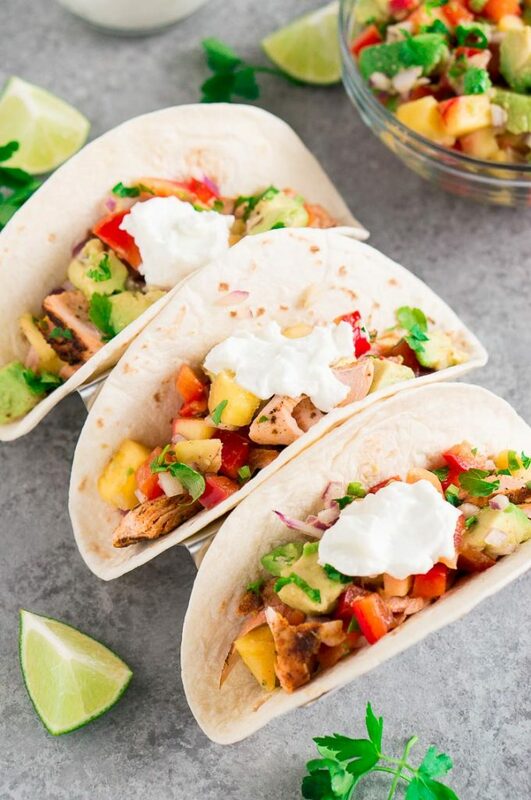 Fill each tortilla with salmon chunks (about 1/3 of each salmon fillet), top with pineapple avocado salsa, and about 1-2 Tbsp of the yogurt. 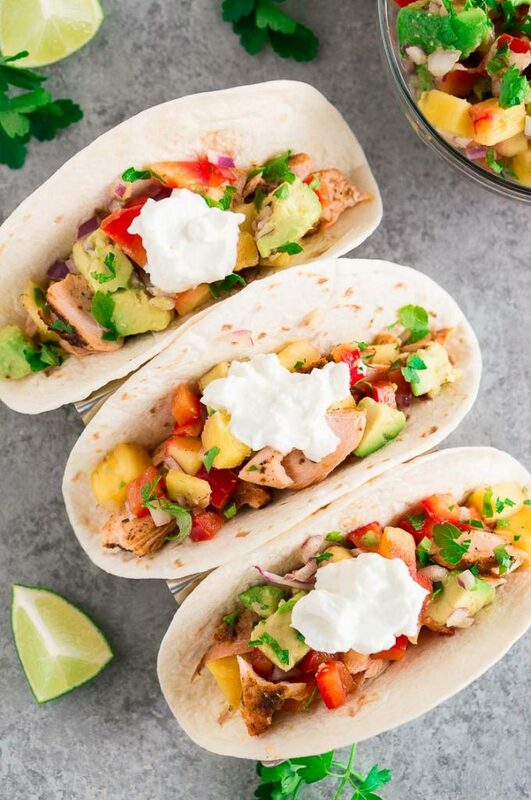 I seriously think I see my dinner here on this page for tonight I just love salmon and never thought to do it in a taco! Awesome idea! These blackened salmon tacos look so yummy. The pineapple avocado salsa gives it that pop of color and flavor that is sure to please a crowd. 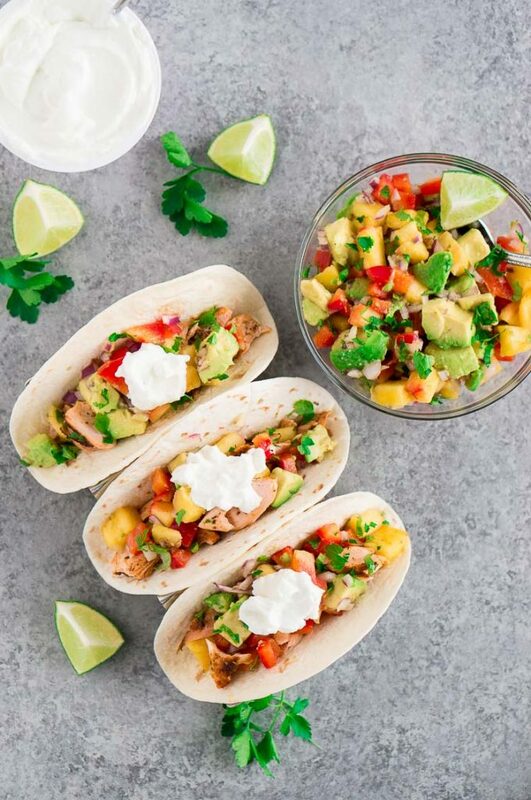 We love salmon tacos and a fruit salsa is a must! Perfect summer food. Brilliant! 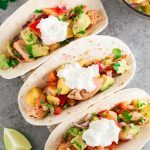 Never thought of making salmon tacos but salmon being one of my favorite dinners, I will definitely try this beautiful recipe of yours! And that pineapple salsa!!!! Love it! I’m obsessed with fish tacos and these are amazing!! The Fage sauce is so good!! 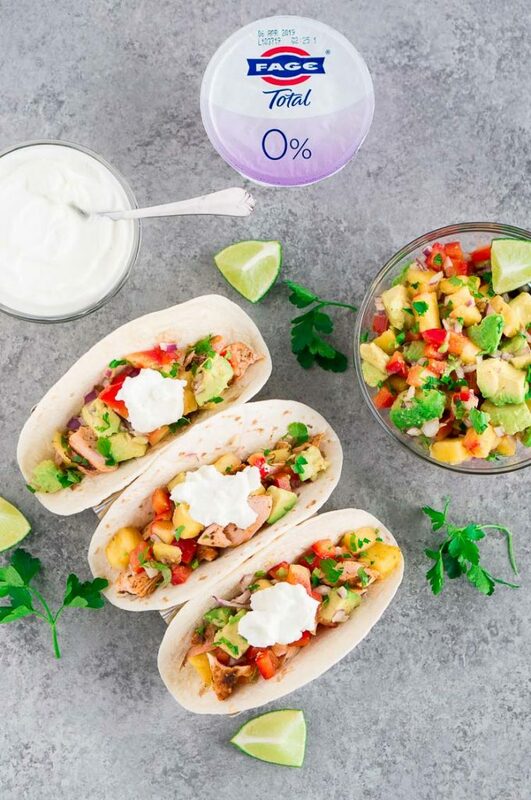 I have never thought to add yogurt to tacos, but this sounds lovely! Great twist for a great meal! We always use yogurt instead of sour cream! It’s so much more versatile. Also, I’ve made fish tacos with tilapia and cod, I can’t believe I’ve never used salmon! We eat so much salmon and I love them in tacos. With this delicious pineapple avocado salsa, I bet we are going to make this recipe over and over again! So many wonderful fresh flavors in these. I love the addition of the yogurt for the added creaminess. Yum!